The Berrygarden is a feature released along with the "Big Spring Update". It can be accessed by hovering over the Town tab, which is at the top of every page, and then selecting Berrygarden. You must be Trainerlevel 8 to unlock the Berrygarden. The Berry Garden tab is where users can view their Gardener Level and plant/harvest their berries. Gardener level requires "star" which are experience points to level up. Stars can be gained through various activities such as growing berries, completing bulletin board tasks etc. The higher the level you are, the more features you are able to unlock. Garden 1 in the Berrygarden. The Gardener Level is a representation of a user's gardening skill in the Berrygarden. It effects the areas you unlock in the Berrygarden as well as what types of berries you can plant. It can be increased by collecting Garden Experience Stars, which are obtained by planting seeds, watering berries, and harvesting berries. Your garden is where you plant and care for the seeds of the various berries you've collected. There are four different tools to use in the garden: the SquirtBottle, the "Harvest" basket, the Seed Bag, and the Mulch bag. The SquirtBottle allows you to water your seeds so they can grow faster. The "Harvest" basket collects all ripe berries from the garden. The Seed Bag holds your entire collection of seeds that you can choose from to plant in the garden. The Mulch bag has a variety of Mulches that, when used, have a variety of effects on the plants. There are 4 different gardens that you are able to buy, and each one is unlocked at a different level. The Berry Bag feature allows you to move berries from your Item Bag into your Berry Bag. This is a one way process however, and all berries transferred over are automatically at Level 1. The Tool Shed contains the tools and machinery needed to process berries into seeds and to cook meals using your berries. The Seed Makers are machines that process your berries into seeds. 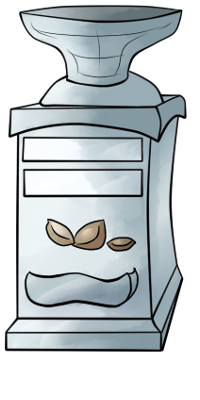 Each Seed Maker has a different size queue and speed, and they can be updated by using PD. When a berry is processed into a seed, the Berry Level has a chance to go up. The Berry Level can only go up, not down. The Cooking Pot is a special pot that allows you to cook various meals. Recipes are unlocked by boosting your Gardener Level, and each recipe has different ingredients and required heat. Using the cooking pot often will allow you to upgrade your cooking pot so that you can cook meals at higher temperatures. The Berry Market is an area where users can sell their berries and meals that they've collected to other users for cheap prices. When you first access the Berry Market, you are given the option of buying a booth in one of two colors, red and blue. In this booth, you can sell different berries and food items that you acquire to other users. When setting the price for the item, there is a recommended price for each item. Pricing your item too high above this may cause other users to not buy your items and go find them at a lower price. The PokéDollars earned from selling items at your booth is subject to a 5% tax. A minimum of 100 PokéDollars must be earned before you can collect from your booth. 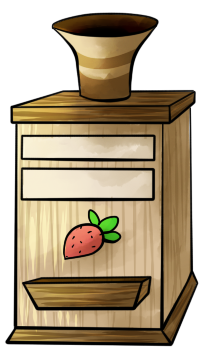 The Booth Search is a feature of the Berry Market that allows users to search for specific berries and meals. There are three search options: Lorelei's Booth, Booth Owner, and Item. 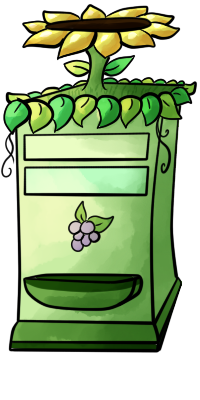 The Lorelei's Booth option sends the user to Lorelei's booth, where she sells Soda Pop, Lemonade, Oran Berries, Aspear Berries, Pecha Seeds, and Chesto Seeds. These items are all at a set price and never run out. The Booth Owner option allows users to search for a specific booth owned by a specific owner. All the user has to do is type in the username of the booth owner, and they will be sent there. The Item option allows users to search for specific items that the user has unlocked and select what levels. The user cannot search for an item of a higher level than what they have unlocked. The search feature finds the booths with the lowest price automatically. The bulletin board holds a variety of tasks for you finish in exchange for experience stars and some pokedollars. It requires you exchange your items (berries, food etc.) in order to complete the task. The reward for the task varies but almost always includes a sum of pokedollars and experience stars. You can remove a particular task if you do not wish to complete it. A new task will be given after 15 minutes. This page was last modified on 28 January 2019, at 17:12.